Even so, I know the pleasures of slowing down…see, you can stop time. Because it is, all so relative. On a recent Wednesday afternoon, I caught myself trying to skip ahead of an elderly gentleman as we both approached the door to a lunch stop. I wasn’t consciously trying to beat him to the door, but my instinct was to hurry in and hurry out. Catching myself, I wondered whether the 30 seconds I would save were really worth challenging a 70-year-old, and I slowed down. And that decision allowed me to allow him to hold the door open for me. It was a small pause, so worth taking. I once saw an advertisement for “fast yoga” on the door of a fitness center. Call me old school Indian, but that reads like an oxymoron. That aside, it seemed to fit with the kind of life we have created here. That dynamic may be at work as you read this newspaper. Scanning constitutes reading to most; we want news stories told in the first two sentences, TV sports formatted to our limited attention spans, movies to get to the point already and clicks to respond instantaneously. We have become so impatient that even flying (you know, soaring above the miles you would otherwise need to walk or drive) seems tedious and prolonged. Where will this mindset collapse? Are we programming an entire society to develop ADD? In a series of interesting studies conducted by Harvard, MIT and National Geographic on longevity and happiness, science confirms what Patanjali knew 2000 years ago, i.e. the physical and mental benefits of meditation and slowing down. Of particular interest to me are molecular biologist turned Buddhist monk Matthieu Ricard’s research and explanations of the subject; some have called him the happiest man in the world. He isn’t on the fast track to anything. Stress, it turns out, directly affects your lifespan, shaving those years off the tail end. 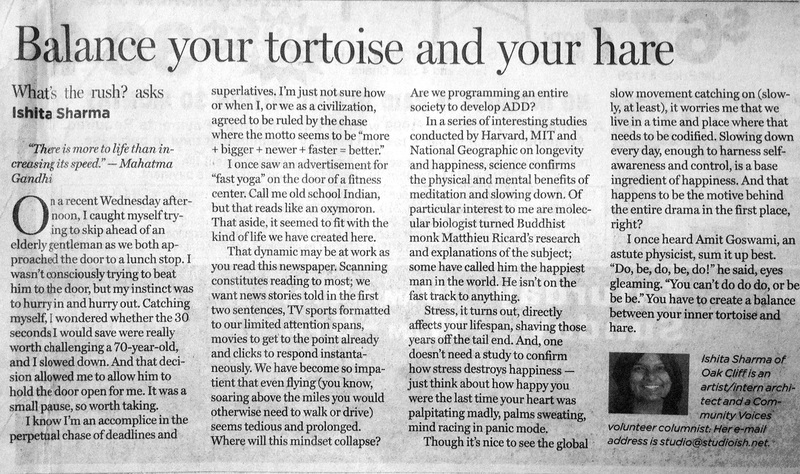 And, one doesn’t need a study to confirm how stress destroys happiness- just think about how happy you were the last time your heart was palpitating madly, palms sweating, mind racing in panic mode. Though it’s nice to see the global slow movement catching on (slowly, at least), it worries me that we live in a time and place where that needs to be codified. Slowing down every day, enough to harness self-awareness and control, is a base ingredient of happiness. And that happens to be the motive behind the entire drama in the first place, right? I once heard Amit Goswami, an astute physicist, sum it up best. “Do, be, do, be, do!” he said, eyes gleaming. “You can’t do do do, or be be be.” You just have to balance your inner tortoise and hare. Very mature and balanced article, justifying the spirit of the title. If only we could practice what we preach! But it is said, you are what you think. With thinking moving in the right direction, one can hope for life taking following the same. So congratulations on setting the right thinking process for your readers, hope they think seriously enough by taking some time out for themselves from their busy lives. Good work!